Many American families will spend the holiday season eating too much, watching a game or two on the TV, spending some quality time with each other, or simply trying to avoid unnecessary family drama. For some families, quality time together is a regular occurrence, but for many others, it usually only happens around special occasions and the holidays. If family events do not happen frequently in your household, one thing you may want to do this holiday season is set aside some time to discuss long-term financial goals such as retirement. Traditionally, the “money talk” has been viewed as a taboo topic, but families who avoid discussing financial matters may be setting the stage for bigger problems later in life. 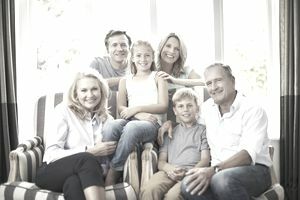 While the retirement “talk” may not seem like the most exciting or enjoyable topic of conversation around the dinner table, with more and more challenges in the world that impact our overall financial well-being it may be one of the more important conversations you will ever have in your life. When our family gathers around the dinner table this holiday season it is highly likely that we will cover a broad range of topics such as college and NFL football playoff scenarios, where to go hiking to burn off the holiday feast, and how to manage the children being out of school for an extended period of time. No matter what your enjoyment level for personal finance talks may be, the retirement talk doesn’t usually climb to the top of most family to-do lists during the holidays but you eventually need to address the elephant in the room. Take time to define what the word “retirement” truly means to you. Think about some of the things that you look forward to doing the most. You may have current hobbies or volunteer work that you enjoy and want to be able to devote more time towards. Do you have any travel-related goals or do you simply want the sense of financial independence that you can continue to meet your most important life goals using passive income sources? For some people, retirement may involve continuing to work or pursuing self-employment and entrepreneurship goals, or doing something you have a passion for and that provides a great deal of satisfaction and enjoyment. There is no right or wrong here so dare to dream and identify the possibilities for your own retirement. The main idea is to go beyond the dream stage and start putting your life goals in writing. Are you on track to reach your retirement income goals? According to the National Retirement Risk Index over half of the households in the country are at risk of not being able to maintain their current standard of living during retirement. Research from Financial Finesse also suggests that only about one in five employees in the workforce are confident they are on track to reach their retirement goals. A majority of employees have not even gone as far as to run a retirement estimate. With projected shortfalls in Social Security and Medicare, coupled with a higher chance of living longer, now more than ever we need to start building up our retirement savings. Then, talk about your results and run a few different what-if scenarios to brainstorm strategies to find extra savings for retirement. What are the biggest obstacles along your journey to retirement? Most people report that fear of outliving their money during retirement is their top concern. Related concerns include paying for health care, longer life expectancies, and global economic uncertainties. Perhaps the biggest obstacle during the retirement planning process is self-induced and that is procrastination. Whatever your obstacles may be, spend some time identifying ways to improve your financial wellness today so you can minimize their impact as you approach retirement. It may sound like a wild and crazy idea to mix a financial planning discussion with family fun over the holidays, but the longer you delay these important money talks, the harder it will be to make retirement dreams become a reality. Not only will a productive long-term planning discussion increase the chance that you or your loved ones will reach important life goals, but it may also provide peace of mind that you are taking the right steps to prepare for your own Financial Independence Day. You may not cover everything in one sitting, but at least you are attempting to create an open dialogue about important money matters and taking steps to improve your outlook for retirement.